This recipe is brought to you by Courtney McBroom and Leslie Discher, the women cooking up a storm behind Large Marge. These gals are dedicated to creating delectable new-American food in the Los Angeles area and have whipped up a summer treat just for you! Ice cream, whether it’s on a cone, in a milkshake, or eaten with a spoon is our favorite way to satisfy our summer sweet tooth. 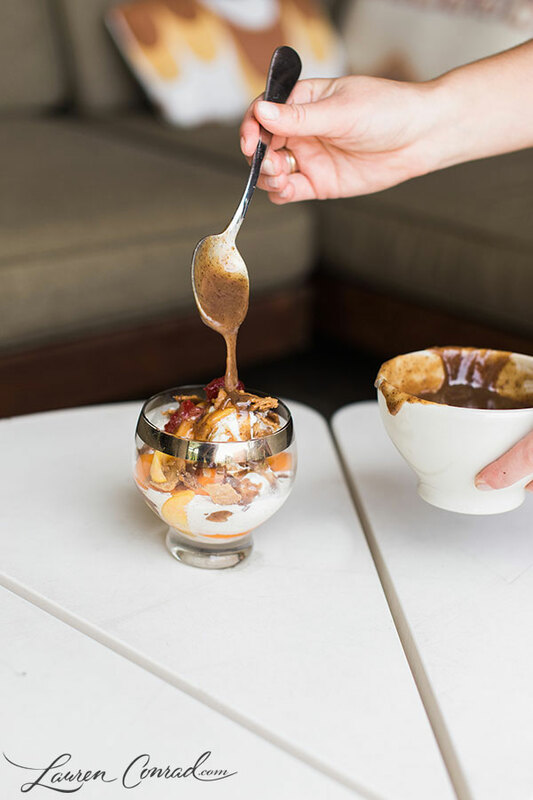 That’s why we are so excited to share these Vanilla-Poached Stone Fruit Sundaes with you! This simple summer dessert with an unconventional twist is fun to make and even more fun to eat. 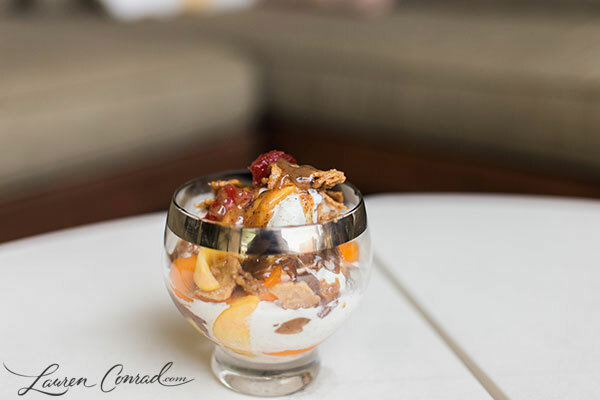 The homemade stone fruit topping gives a traditional sundae the perfect gourmet touch. Just sprinkle a little bit of crushed ice cream cone pieces on top and you’ve got yourself the ultimate summer treat. Is your mouth watering yet? Peel and slice the fruit into thin segments and put them in a medium heatproof bowl. In a small saucepan, bring the water to a boil, stir in the sugar and vanilla. Remove from heat and continue to stir until all of the sugar has dissolved. While it’s still boiling hot, pour the vanilla syrup over the cut fruit and let it sit at room temperature for at least 30 minutes. At this point, put it in the fridge until you are ready to build your sundaes. Find your most beautiful parfait glasses and line them up on the counter for assembly. Drop a few pieces of vanilla poached stone fruit in the bottom of each glass, then drizzle 1 tablespoon of warm caramel sauce over the fruit. Scoop two balls of vanilla ice cream on top of the caramel sauce/stone fruit loveliness, then repeat the process by adding another layer of fruit and caramel sauce. Do this as many times as you can without overflowing the glass. 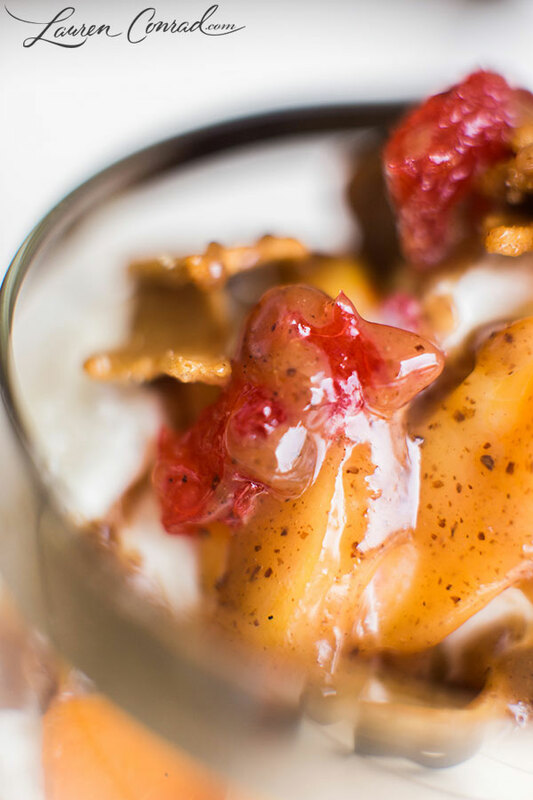 Top each sundae with a drizzle of caramel sauce and a generous sprinkle of ice cream cone pieces. Enjoy! 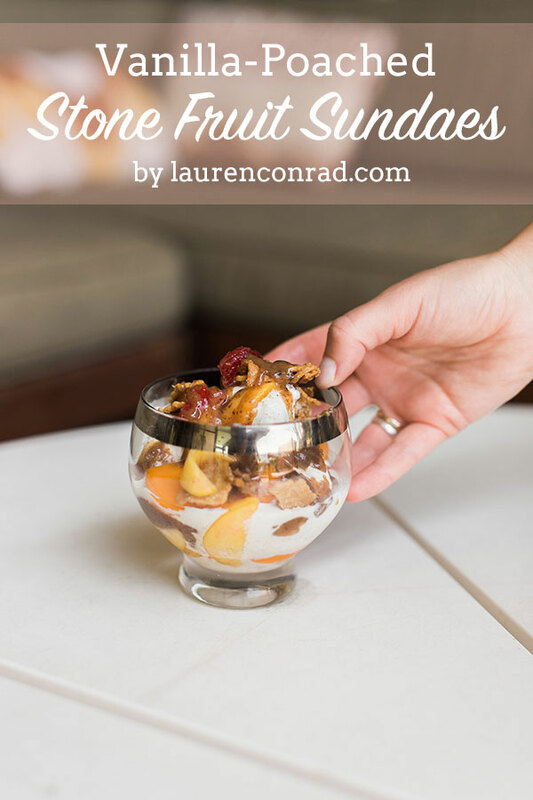 Will you be recreating these stone fruit sundaes?